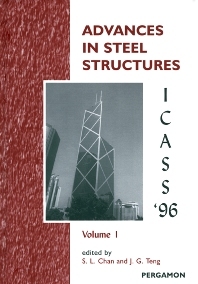 These two volumes of proceedings contain 11 invited keynote papers and 172 contributed papers presented at the International Conference on Advances in Steel Structures held on 11-14 December 1996 in Hong Kong. The papers cover a wide spectrum of topics and have been contributed from over 20 countries around the world. The conference, the first ever of its kind in Hong Kong, provided a forum for discussion and dissemination by researchers and designers of recent advances in the analysis, behaviour, design and construction of steel structures. The papers in the proceedings report the current state-of-the-art and point to the future directions of structural steel research. Volume I contains 93 papers on the analysis, behaviour, design and construction of framed structures and bridges, with 90 papers in Volume II dealing with plates, shells, analysis, optimization and computer applications, dynamics and seismic design, fatigue, and soil-structure interaction. For practising engineers, designers of steel structures, academics and researchers. Volumes, section headings and selected papers: Volume I. Keynote Papers. Research, code and design implementation of steel structures in China. Selection of safety factors for use in steel construction. Beams and Columns. Behaviour and design of thin-webbed beam-columns. Flexural strength of laterally unsupported angle beams. Application of the component method to column bases. Frames and Trusses. Large deflection analysis of framed structures with flexible connections. Cyclic response of flexibly jointed frames. Strength and deformation properties of steel frames under fire conditions. Space Structures. Collapse of imperfect reticulated dome with semi-rigid connections. Geometric nonlinear analysis of transmission tower with continuous legs. Connections. Experimental analysis of steel beams with semi-rigid joints. A new proposal for the classification of semi-rigid connections based on the elastic-plastic behaviour of frames. Composite Construction. Composite hollow steel tubular columns filled using high strength concrete. Bridges. Structural types and endurance aspects of crossbeams in steel orthotropic plate girder bridge. Design and Construction. The technical research & application of colour precoated steel frame curtain wall. Volume II. Keynote Papers. Upheaval and lateral buckling of submarine pipelines. Plates. Analysis of the t-shaped stiffened bracket plates. Nonlinear analysis of thin-walled structures using marco spline finite elements. Shells. Non-uniform lateral pressure solutions for containment vessels. Efficient use of high strength steel in large, elevated grain silos - a case study in a design/construct project. Localization of plastic buckling patterns of plates and cylindrical shells under cyclic loading. Analysis. Basic modelling issues on the use of finite element analysis in the study of stress behaviour in cracked bodies. Theory and testing of cable structures and cable structural elements. Optimization and Computer Applications. The fully stress method for layout optimization of truss structures. Product models for structural steelwork - a basis for computer integrated data transfer. Dynamics and Seismic Design. A comparison of the dynamic behaviour of steel and concrete structures. Vibration studies of composite laminates with elastic edge supports. Fatigue. Hysteretic behaviour of stiffened flat-bar braces. Fatigue behaviour of structural tubular node using fracture mechanics analysis. Soil Stucture Interaction. On effect of variable length of long steel piles-sensitivity analysis.